And something like this for a valve? https://au.rs-online.com/web/p/pneumati ... s/1215879/ although these seem to be 24v ... maybe they just run slower at 12v? Hey Russell, ill keep with the MPS for a while. Still got 10 mph to find out of mine yet. Its got to be in there somewhere. Yours is looking good but not so sure I would rely on anything electric on the salt as far as looking where im going although you have it covered if it has a meltdown. She sounded great this year ... just watched some video of you taking off. Just saw this great video on Speed Demon and thought you all might like to take a look: https://youtu.be/-t0RSBnNLyQ. I was wrong regarding the water tank the the motor image I shared a few pages back ... it seems that black box is all oil. The 20 gallon water tanks can be seen at 15:43 in the video. They made them round, just in case they blow a head gasket and they over pressurize the water tank it wont get any larger. I'm calling it the short version for obvious reasons! My extreme lay down position was causing a few problems that necessitated more and more solutions to overcome ... so I went back to the original goal (to occupy the same frontal area as the motor) and found that I could adopt a far more conventional riding position and still say almost entirely within that frontal area. In reality, photo's from this years event showed I was exceeding the target envelope even with the lay down position; I built up the chest pad so much to take the load off my arms and shoulders that my head was popping over the top of the motor my a significant amount. Richards kneeling position got me thinking knees forward. But it turned out I could go even more conventional. If I'm chopping the front of the frame off I may as well tweak the rake angle. It'll be 25 degrees which follows advice here, and what Ralph Hudson runs to 300mph. I'll make it shorter (which makes packaging of fuel and water slightly more complicated) but will help with getting my center of gravity ahead of my center of aerodynamic force. Both will make it easier to maneuver at low speed. A consequence of that is I don't think I'll need outriggers now, so won't be making any. I'll cut the head-stem down like Bone's bike to give more room to let me get my head right down. I'll still use a forward facing camera and screen that will be placed (in the shade) between the frame rails so I can look straight down at it. The rear of the bike is unchanged (if you don't count the LS3!). Anyway, happy to hear everyone's thoughts ... there's still time to change the design before I get back in the workshop in October. But I feel like the design is solving problems now rather than making them. There is a point in any build where you finish creating problems and can suddenly move forward. The least number of compromises the better but often the simplest design is the hardest to achieve. Yep, never be afraid to tear it up if it ain't quite right. Difficult sometimes, your right. Have you considered a riding position like Dan Gurney's Alligator? With the V8 behind you you could get very low with no difficulty and probably not need the screen to watch. Chris, Harky, Stayt'ie ... for sure, words to live by. I'll never let my pride get in the way of going faster! I like the cushioning effect from having my spine tilted forward too. I have a feet forward Harley on the street and if you hit a bump without expecting it the jolt goes right up your spine. It might be because the weight of your torso is straight above your hips rather than pivoting froward from them. Now, I just need to get as flexible as her and loose the beer gut. Dave, this ones for you! 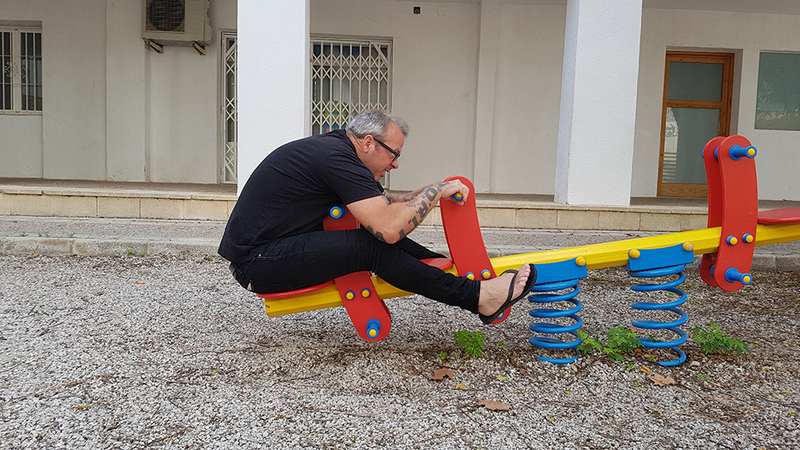 I'm still in Spain so I had to use the local playground ... my chest is touching that rearward handlebar, but in my current state of flexibility I couldn't get down any further anyway. Need to bend more from the waist so the neck doesn't need to hyper extend. I was quite easy to get my feet into position though and my knees weren't really in the way with my feet so far forward. Quite like this colour scheme! That's perfect, even the colour's good ! 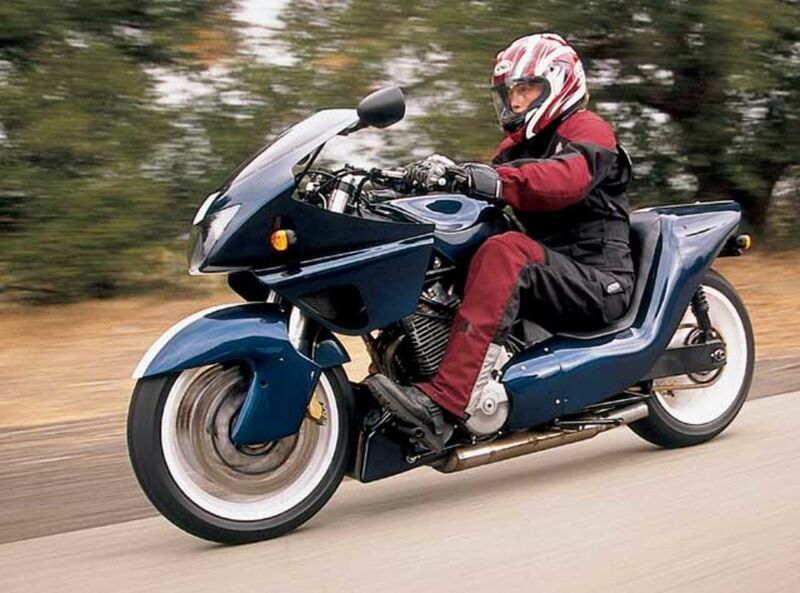 Mine will be much more like Bill Anderson's Weslake lay down sidecar. I can't do a more conventional riding position because I herniated a disc in my neck back in 2012 (sitting in a chair!) and can't lean forward and look up. Even a Ducati Diavel is instantly too uncomfortable. I can't lean back as far as Bill because his engine is much shorter than mine (a VFR750 with a supercharger and intercooler). It will have the maximum allowable wheelbase (110 inches). 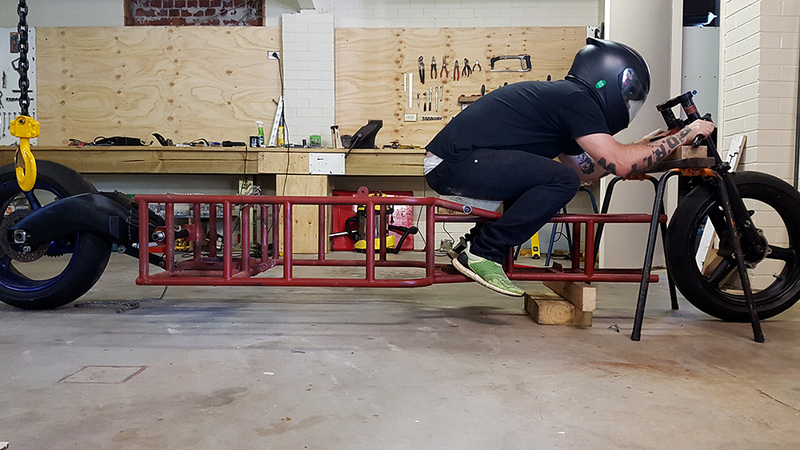 It won't have any suspension but it will eventually have swoopy bodywork. No photos yet, it's just a pile of parts laid out on a jig table. The sidecar will house the air to water intercooler laid flat alongside the motor. 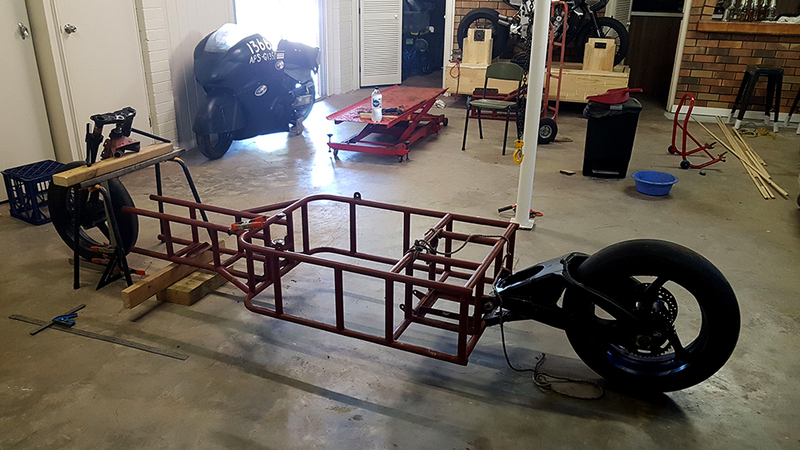 It might, just might, be ready for 2020, I am still restoring my Formula Vee which I can use maybe twenty times a year without leaving south east Queensland. Dave, I have my fingers crossed for you for 2020 ... sounds like a cool machine! Finally I'm back and have my new workshop set up enough to actually make some progress on theTRUTH. Happy about that, its been a long time between drinks! And the top tubes going in, just tacked into position. Luckily the tube notcher works upside down! It wasn't any good for the shallow notch at the base of these tubes but hours with the grinder and file did the trick. 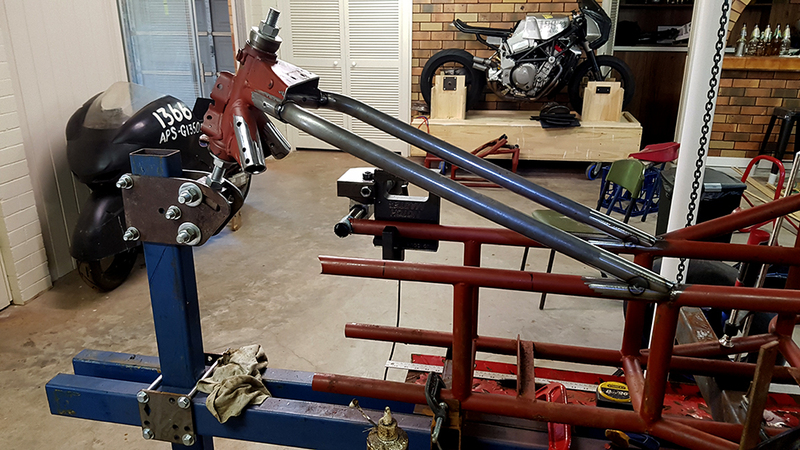 I was going to cut the steering head tube down, or turn up a new one, but the saving in height wasn't going to help much and I'm keen to get on with it so it has a fighting chance of actually getting done! Rake is now 25 degrees, wheelbase is short enough to get in the truck without partial disassembly and the riding position gives me plenty of strength in the legs to balance the motor at the start line and taking off ... it's early days, but I'm gonna call it a win. Thanks to everyone who's offered advice, I'm sure you can see the effects, please keep it coming! A lathe is definitely on my list Harky! They are getting rid of a nice Colchester at my work, but its a bit far away from home now, and 3 phase adds to the expense of relocation. Nice setup.